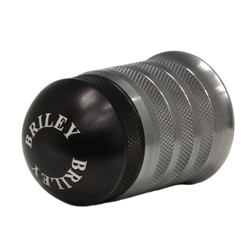 Our new adjustable Forend cap weight for Winchester SX3 and SX4 Shotguns. Components are manufactured from 416 stainless and the whole unit weighs 6OZ. To increase its weight simply purchase one or more of our generic 2OZ weights (BWMOD). You simply unscrew the aluminum cap, add your additional weight/s and screw the cap onto the last weight. It is also available in Black Oxide.